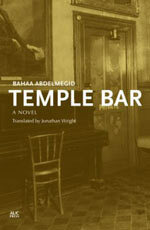 Following on from last week’s interview with Bahaa Abdelmegid, here is an extract from his new novel Temple Bar. The story of a young Egyptian academic, Moataz, who is embarking on a PhD on Irish poet Seamus Heaney at Dublin’s Trinity College, Temple Bar explores the marginalisation, cultural misunderstandings, and racism he encounters during his year’s study abroad. Here we pick up the story on Moataz’s arrival in the Irish capital. I was waiting for someone to help me carry my bag, but no one volunteered. Aggrieved that I asked, one young man said my bag was my business, while a woman suggested that there were bags with wheels that didn’t take so much effort to drag. Then she laughed. I would find out later that there was a scare about strangers and bags, which might contain explosives since terrorist operations were common, especially in Belfast in Northern Ireland. Dublin didn’t seem surprising at all. It wasn’t as I had expected a European city to be. The streets were narrow. There were the modest English-style terraced houses, the old bridges across the little river, the simple shops, the children begging, the old people, and the impetuous young people, some of them Irish and some of them immigrants. I waited at the bus station for more than an hour for the bus that would take me to St. Patrick’s College in the town of Maynooth in County Kildare, where there was going to be a conference on Irish literature and its relationship with the concept of the land. I passed the time reading the newspaper, which was all about the problems in parliament, the Good Friday agreement, and decommissioning IRA weapons in Northern Ireland. In front of the station there was a very beautiful hotel. I was drawn to the building, which suggested the style of the Victorian era. The old wooden entrance reminded me of the mashrabiyas and arabesques in the Hussein and Khan al-Khalili area of Cairo. The bus came and the passengers moved toward the door slowly and steadily. There were some reassuring smiles from other passengers. I enjoyed looking at the plains, the valleys, the green hills covered in clover, and the streams. Despite the beauty, a cloud of mist covered the horizon, creating a sense that the end was nigh, and there were moments of the usual melancholy. The sun had almost moved on to other lands but I could still make out what the town of Maynooth was like—a quiet town with houses no higher than two stories. The main street rose toward a large Gothic church called St. Mary’s, with a tower and a large cross at the entrance. In front of it there was a large open space with a statue of the Virgin Mary in the middle and a gas station on one side of the road. The town looked quiet and different from Dublin, but I felt depressed because the town was full of old people. Young people were few and far between, even rare. I didn’t see any children in buggies or walking next to their parents. I asked for directions to the venue for the conference and they pointed to a large church, the church of St. Patrick, who drove out the snakes and became the apostle and patron saint of Ireland. When I went down the drive the greenery on both sides was dazzling, strong, and imposing. The church rose high with its towers, its crosses, and its Gothic windows. “Where are the other conference guests?” I asked. “They haven’t arrived yet. They’ll be here tomorrow. You came early,” he replied. He left me and went off. I stayed alone in the room. I opened the window but could see only darkness. The greenness that had stunned me at the entrance to the church might as well have been ghosts and a bottomless sea of darkness. I was afraid. I closed the window quickly. Suddenly I heard the sound of approaching footsteps. I was delighted. I stood up to open the door in the hope of seeing someone, but I had a shock: there was no one there. I sat on the edge of the bed. I looked at the ceiling and the walls, then, suddenly, the window burst open and a draft of air blew in. The sky rang out as if there were thunder and lightning. I quickly closed the window. I didn’t know what had happened. Suddenly a shiver ran through my body and I felt a slight crawling in my scalp. “I’ll read a book,” I said. I felt hungry and cold. Then I said, “I’ll go to sleep,” and I turned out the light. I tossed on the bed. I felt that a hand was touching me. I opened my eyes and saw the window opening again. Someone had escaped through it. I shuddered. I cried out for my mother as I always did when I had nightmares. I sprang up and ran for the light switch. The room lit up. My heart raced and my mouth dried up as if I were in hell. I heard strange noises. I ran to the window as fast as I could and closed it. I felt a hand touching me, a strange hand, soft and cold and hard. I screamed again, then rushed to the door and called the supervisor. But he didn’t hear me. After a while he came to me calmly. I told him what had happened. He said it was the wind. I said, “No, it wasn’t that. There were people.” Suddenly a worker, who was one of the church people, arrived and made the sign of the cross on his chest. “The Lord bless our martyrs and our apostles,” he said. So they’re real. This place is haunted. I trembled like a young child and the supervisor was surprised. “I’ll get in touch with the church security,” he said. “They’re the spirits of the monks who taught here a while back. Most of them committed suicide or went to the sanatorium, and some of them disappeared and this place was abandoned. No monks or theology students came here any longer, so the church and the local council decided to convert it into low-cost lodgings.” I remembered my friend who was studying at al-Azhar University in Cairo and living in the halls of residence. He told me how the halls were full of ghosts, especially when there was a power cut, and the students would shout out, “Awad, Awad”—the name of the ghost who was said to appear to them. It was also said that this Awad was an electrician who had been electrocuted repairing a fault in the wiring, or that he was a student who was killed in the dark by one of his friends because of an old vendetta. His ghost continued to appear to the students whenever there was a power cut. And it became customary that they called out his name. After the supervisor called security, they came of course, a man and a woman, and a state of emergency was declared. The man gave me a sympathetic look. The woman came up to me and patted me on the shoulder as if I were a young child. “Tell us what you saw and what you heard,” they said. I told them. As I told the story, the expressions on their faces frightened me. I was alarmed that they believed me. So the ghosts were real. “What do you want to do?” they said. “I’d like to leave this place immediately,” I said. The woman in charge of security called a taxi from her cell phone. In a while it came. The driver was a lump of meat but he had a kind face and was cheerful. Visit ibtauris.com/arabicfiction for more information about our collaboration with the American University in Cairo Press. Bahaa Abdelmegid teaches English literature at Ain Shams University and is the author of two collections of short stories and four novels, including Saint Theresa and Sleeping with Strangers. Jonathan Wright is the translator of a number of Arabic novels including Rasha Al Ameer’s Judgment Day and Fahd al-Atiq’s Life on Hold. He was awarded the 2013 Saif Ghobash Banipal Prize for Arabic Literary Translation for his translation of Azazeel by Youssef Ziedan. Image courtesy of Damián Bakarcic. Tags: Arabic Fiction, Bahaa Abdelmegid, Dublin, Temple Bar, Translation. Bookmark the permalink.